Why ICT’s videos are not available on youtube? I am lost here, could you guys please help me out? ICT took all of his videos out @@? Do a search on youtube for Inner Circle Trader. His channel on youtube has videos on it. But all of the previous videos he has uploaded is gone, right? I don’t know the reason why. Have anyone saved these valuable videos? thefisherman you should read the thread. 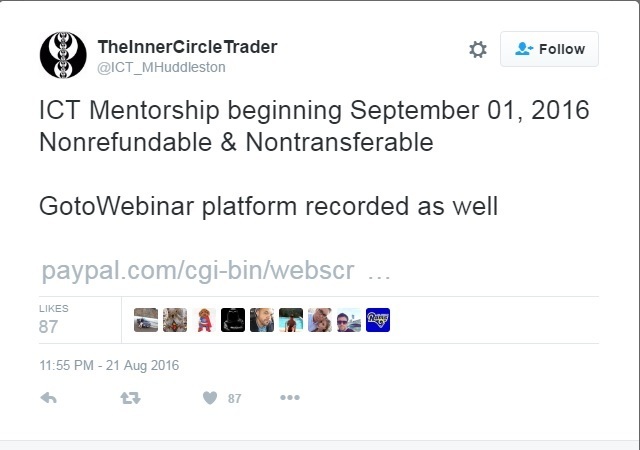 They are referring to Michael J Huddleson who had a screen name of innercircle trader or ICT. He never tried to sell anything to anyone. this doesnt quite seem to be behavior of a successful trader who can make money on trading and so doesnt need to sell mentorship. huh? He certainly took his time to reveal his true colours, but i suppose when you’re on welfare you’ve got all the time in the world to reel in, cultivate & produce a half decent scam, time is your best friend. We were all over that clown like a rash when he initially rocked up on here & warned folks constantly to avoid him like the plague yet were ridiculed & attacked at every turn. He even hoodwinked a few supposedly eminent honory members. And before this idiot made his grand entrance it was the same deal with another fool called Tymen & undoubtedly others before him. All the usual gullible sheep, including a few supposedly wise owl fx honory (cough) members willingly & actively promoted & backed all his flowery verbiage & ridiculous nonsense which should tell you all you need to know about their naivety & susceptibility to these time wasting deadbeats. Hell, one of them even initiated a whole thread wasting god knows how much valuable time & energy deciphering & translating all his comical gibberish slang into plain english so the other sheep could understand what the hell he was babbling on about……LOL. You wait, to save face the same fools will be bleating that he actually deserves to be recompensed for all his time, efforts & dedication. In retail gambling there literally is one born every minute & circus clowns like huddlestone illustrate that point beautifully. He even had the forum moderators & administrators fooled….several times. It truly beggars belief, it really does. Little wonder the scammers flock to these joints in their numbers. which member/thread is that then Billy? i know it’s a wee while ago but i don’t recall clocking it. Enjoy with a tot of malt & a fat cigar! He certainly messed with more than his fair of heads & wallets here & elsewhere by all accounts. I can’t remember the exact name of his biggest failure, some yappy canadian kid….Darren or Aaron or something? He had a strange username & as with a few other weird fanboy’s, got himself banned in the end. Him & the sockpuppet kept re-appearing in multiple nicks didn’t they? He blew an absolute fortune following the advices & recommendations of that sockpuppet though. And he wasn’t the only one by any stretch. The galling thing though was the Clint’s, Peterma’s & Hogarstes – apparently respected honory members – continued to enthusiastically bang his drum encouraging more naïve newbies into the pen, even after he cremated 2 or 3 demo accounts! I am actually quite shocked at the flow of ideas, instead of focusing on improving your trading tools, you are wallowing in the mire and to top it off, I dont know mr ICT, and I was here long before him, and didnt know him then, I hardly even know him now, but I did watch a few of his recent videos on you tube and guess what, anyone who listens to ICT and says he doesnt know what he is talking about sure does NOT know how to trade. When I Say knowing how to trade, that does not including giving all your money away all the time, losing is not knowing how to trade, when you truly learn how to trade, you wont talk about people who DO know how to trade stating publically that t hey this or that, haha really? if you listened to one of his videos and learned nothing and imagine what ict says isnt true, I suggest you close any and all live accounts as you will continue to lose money there. if you are unable to learn to become a MORE profitable trader by listening to ICT, and continue to image what he says is wrong, then stop and think for a minute and FIGURE OUT why you keep losing money in forex? Guess why? I know why! you dont know how to trade, ICT does, and anyone who knows how to trade can listen to ICT for 15 minutes and KNOW he knows how to trade. SO publically stating ICT is ignorant does nothing but show, demonstrate, and prove your ignorance, at least as it specifically relates to forex and the financial markets. I dont know mr ict, and I was here long before him, and didnt know him then, I hardly even know him now, but I did watch a few of his recent videos on you tube and guess what, anyone who listens to ict and says he doesnt know what he is talking about sure does NOT know how to trade. I’ll just say… it’s pretty easy to talk about and make fancy videos about trading the left side of the chart but really hard to trade the real-time right side. It seems that ict is really good at making videos about what happened yesterday, two days ago and last week side of the chart, But has never shown any evidence that he can trade the what’s going to happen tomorrow, two days from now and next week side. Here’s a challenge for you. If you still think his videos are so great, please watch and study all you can. Then open a $1000 demo account and for three months trade that $1000 demo account using all ict best and most advanced methods. After three months come back here to babypips and give us a report on how well you did following the “ict WAY”. I suspect you’ll quickly find that good old ict is all hat and no cowboy. PLEASE… feel free to do your best proofing that us old ict cynics are full of that you-know-what-stuff real cowboys aren’t afraid to step in. Look following ICT will not make anyone a profitable trader. Following anyone on babypips will not make you a profitable trader. Only you can do that. With that said there is nothing ICT teaches that is his idea. Some of it he may have twisted a little to fit his style. But all of it has been taught by others many many times even still on this forum. Open and read any price action thread and his concepts will be there in one form or another. The OP of that thread probably dont even know who ICT is so how would he know the concept? Because they are not new teachings. In fact some of his teacings are taught in babypips school. So slam the guy all you want about how full of it he is but I challenge you to find one concept that he teaches that is not true and will not work. Sure he didnt tell you if this line crosses that line and all the stars in the solar system are aline then it is a buy signal but if there are cluds outside then short and you will make millions which is what people want. No instead he gave you concepts and told you to figure it out on your own but people dont want to put in the work. Then when they try to throw all his concepts together in one big pile and trade it (lol) they lose money. Then go out and say he dont know what he is talking about. Well is it he dont know what he is talking about or did you not listen to him and take what works for you and you understand and create your own system. Oh wait that takes work and people dont want to put in the work they just think they can come here and stumble across the holy grail and become richer than they ever imagined. Well guess what it is never going to happen. Really well said. People really expect 100% hand holding and order placement for them without engaging their own brains. Did I participate in all ICT threads - certainly not, life is too short. Did I absorb some useful ways to make sense of the charts - absolutely, just as I’ve done from other threads. Do I blame him for any losses or credit him for all my wins - no, that one is on me. But hey I’m 33 years old and I can own all this. Things he said which I didn’t follow - lots. Things he said which I did follow - the importance of consistency in approach, market structure, support and resistance, market swings, the idea/usefulness of of pivots. Nothing unique to him but until he talked about them I didn’t know about him. I owe him only thanks not complaints. We only have X amount of hours in the day. How we spend them is our problem/choice. How we take information and act on it is exactly the same. Our choice.Spend your limited time on becoming a better trader, spending time with your family, going outdoors but not complaining. I know the above statement is hypocritical given that I am spending some of my free time writing but you know what. For what I received from ICT he deserves these minutes. PS I might actually start posting some upcoming trades rather than just statements like most of the above. I think that would be a better way direction for this thread than just standing up for someone who is no longer here. Simple and unambiguous. Yes. Guaranteed? No. This is why I use a stop loss each and every time. Some type of analytical methodology that helps one to believe they understand and predict price movements and are correct on a consistent basis. The discipline and courage to apply a system (designed with RR and back tested) when using ones own live funds. Some of us who are sports fans or participants, understand that knowing what to do to execute a golf swing, or hit a 94 MPH fastball (bucket 1) is different from being able to execute (bucket 2). Admittedly, ICT has played games over the years, and some of his followers on BP got a little extreme with the devotion. The real question it seems to me, is: Is there any value to checking out his (whatever the source) work. I’ve said yes over the years, because he’s helped me to better understand price - bucket 1. I’ve recommended his work to people with the best of intentions, hoping they would gain a better understanding of bucket 1. For some people, bucket 1 might not help, but for some it might. When folks like me make the effort to help others (which is the whole point of a forum) and we get yelled down by some of the intellectually challenged folks, it gets to feel like Baby Pips as a whole is a waste of time, which is too bad. There are some very smart people who struggle with bucket 2. Sadly, there are some less smart people who bad mouth bucket number 1 the way ICT teaches it, because they lack the insight to see the buckets at all.